Welcome back to Scandinavian Christmas, Day 12. I can't believe today is the last day of the series! It has been so much fun hearing from everyone. Thank you all to have participated and have read the series! Today I get to introduce you to my sweets, Ryan. He is mostly German with a small percentage Scandinavian heritage, but we definitely play up the Scandinavian part over the holidays. :) Today he is going to share with you one of his new-found loves: rice pudding. I want to preface the following few paragraphs by fully acknowledging that, prior to this morning, I had never made rice pudding in my life, and in fact, I’ve only eaten the dessert once before. That being said, a few hours from now, the rice pudding in question, may very well be inedible. However, the chances of it being something that people will pretend to like out of politeness are slim to none. And the reason is that the recipe is the one that my wife’s mom (my mother-in-law) (I guess I don’t need to explain what a mother in law is) (oh, yeah…my wife is Kathryn, the Pickled Herring herself) (I’m not sure if it’s grammatically correct to have four parenthetical statements in a row, but I did end a sentence in a preposition in the first paragraph, so who cares, right?) has used since the Kennedy administration. I’m sure SOMEBODY would have told her if it wasn’t good over the course of a half-century. Plus, she’s an amazing cook, so I’m absolutely sure this recipe has no fault of any kind and produces rice pudding not unlike the milk and honey the Israelites enjoyed in the Sinai Peninsula during the exodus. Nancy Tournell (the mother-in-law) is the common denominator in equations that equal good food. And I am the numerator. And by that, I mean I don’t really cook. And by that, I mean I have one specialty. And by that, I mean I cook a lot of Trader Joe’s pizzas. So all I can ask of you, dear blog readers who just so happen to read said blog in the few fleeting hours between the posting time and dinner time…is for you to wish me luck. Or pray. Or both. Cook half a cup of rice, according to package directions. Mix eggs, sugar, salt, nutmeg, vanilla together in a bowl. Scald milk and let cool to lukewarm. Add egg mixture to milk and rice. Pour mixture into a round casserole dish. Set casserole dish into a pan of water and cook at 325 degrees for an hour and a half. Check with a silver knife to make sure it comes out clean. If not, cook for 10 minutes more. Thank you, Ryan! We will see in just a matter of hours just how edible it is. There is no doubt in my mind that you did an extra fine job! And a huge thanks again to everyone that took the time to participate in this year's Scandinavian Christmas series - it was a blast! Welcome to Day 11 of Scandinavian Christmas! Today we will be hearing from my Dad! My Dad and Mom live in Michigan and this Christmas Ryan and I get to spend a few days at home with them. Every year, my Dad bakes numerous loaves of Swedish breads - it wouldn't be Christmas without them! He always told me when I was little that, "If you can read, you can cook," which is kind of ironic because he doesn't do much cooking. 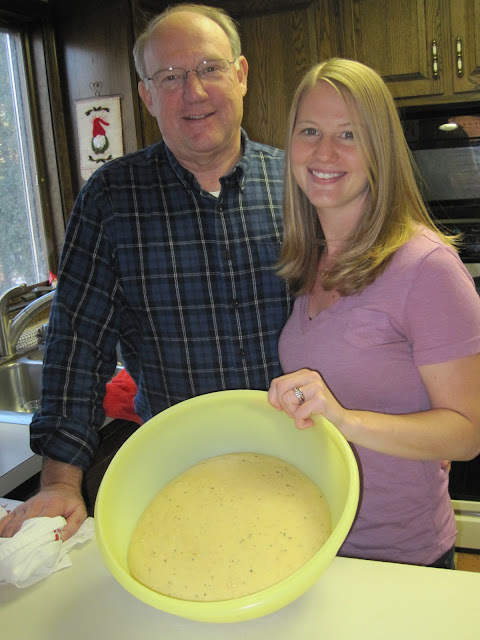 My Dad and Mom both are responsible for instilling my love of all things Scandinavian, and I am so glad he is going to share his great recipe for cardamom bread with you all today! Hi everyone, I'm Kathryn's Dad, Mark. I'm 50% Swedish, and started a tradition of making Swedish rye bread and cardamom bread at Christmas time. These recipes have been passed on from my grandmother, to my mother, and to me. When Kathryn and her sisters were little, they always liked to "help" knead the dough. Many good times were had while baking this recipe together. I hope you all enjoy the cardamom bread. First, scald the milk, butter, sugar, and salt. Cool to lukewarm. Beat the eggs with cardamom. 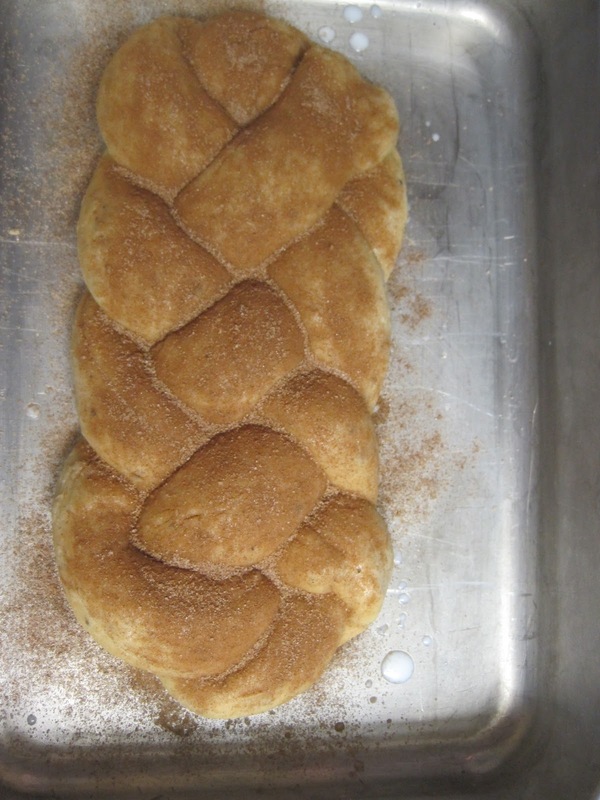 Dissolve yeast + 1/4 cup lukewarm water and sprinkle with sugar to activate yeast. Let sit for 5 minutes. Add eggs/cardamom and yeast to the milk mixture. Stir in 6 cups of flour and beat until smooth. Turn out on floured board. Gently knead in remaining 2 cups of flour. Place in greased bowl. Cover with a towel and let rise until double. After doubled, turn out on a floured board and roll out. Divide dough into 3 parts. Cut each section into 3 or 4 ropes and braid together. I usually do a 4-strand braid. Once braided, brush tops with milk and dust with cinnamon sugar. Place each loaf side by side in a greased lasagna pan. Let rise again until doubled. Reapply cinnamon sugar dusting. Bake in a 350 degree oven for approximately 25 minutes. Makes 3 large loaves. Thanks, Dad! Come back tomorrow for Day 12 of the series! Day 10! Welcome back to Scandinavian Christmas! Today we get to hear from another Astrid from the blog Fab and Thrifty-Something. Her blog is super creative and tells of all her awesome thrifty finds. AstridYou can find Astrid on Pinterest here and her blog here. This is Astrid's very first year participating in the series and I am so glad she joined in the fun! God dag, I am Astrid and I live in Ottawa, Canada. I post about my thrifty, thrift store finds over at Fab and Thrifty-Something. My father’s family is Norwegian and in 2010 I had the opportunity to visit Norway and Iceland. I like to include Scandinavian traditions in my family’s Christmas celebrations. Ice lanterns are very popular in Scandinavia to bring light to the darkness of winter. Last Christmas, I received two Lee Valley ice lantern molds from my mother-in-law as a gift (the price is cheaper if you buy 2 or more!). The star molds are made in Norway. I was excited to try it out and cast a light on my dark porch. 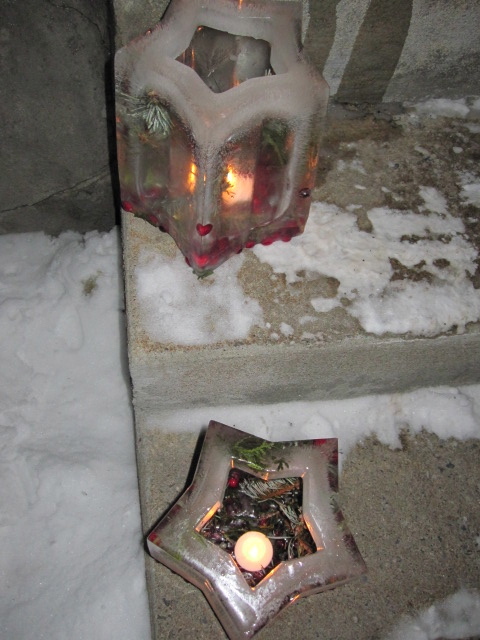 First, I filled my lantern mold halfway with water. 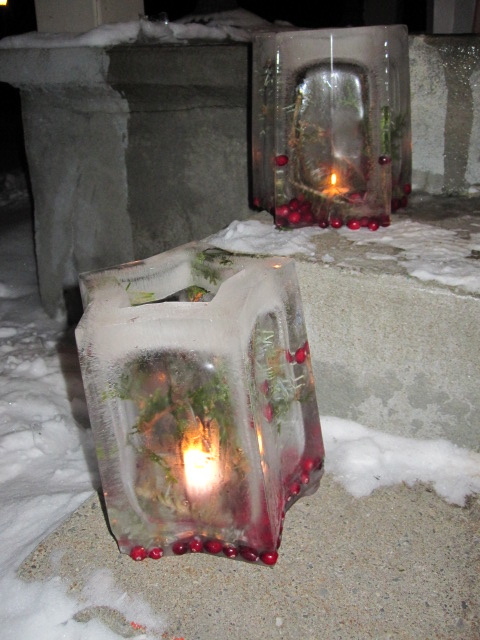 Then I added some frozen cranberries and pine branches for some festive colour. I then left my mold outside to freeze overnight. If you plan on adding greenery, I recommend using a two step approach. First, freeze the water only halfway to avoid your greens floating to the top. Once frozen, you can fill the remainder of the mold with water and leave outside overnight to ensure it's completely frozen. To release the ice, run some hot water over the mold and slide the ice out very carefully. Add a tealight or candle and viola! The warm glow will light any porch or front entrance. Want to make your holiday guests feel welcomed during the Christmas season? 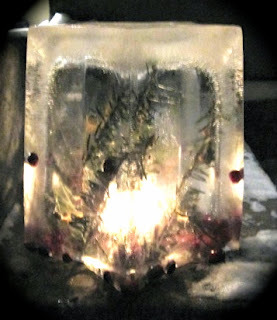 Why not try making one of these star-shaped Ice Lanterns from Lee Valley Tools. Another huge thanks to Astrid! Come back tomorrow for Day 11!